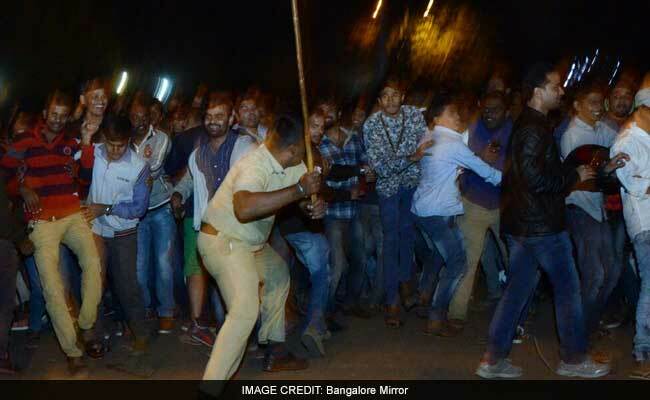 Women were allegedly molested and heckled on Bengaluru's famous MG Road on New Year's Eve. Bengaluru is safe, asserted the state's Home Minister G Parameshwara, faced with an angry city after several women were allegedly molested and heckled on the famous MG Road on New Year's Eve, even as cops struggled to control thousands of revelers who had poured out on the streets at midnight. The Home Minister said there were enough policemen and women in Bengaluru to ensure safety, offering no apology for the incident. "You should also understand the entire culture of celebration of the New Year's thing over the years. We need to regulate and try and organise, we will have to see," the minister said, underscoring that my first priority was "the security of women and children", said Mr Parameshwara, denying reports that about 10,000 police personnel were posted in the city on that night. "You cannot have 10,000 policemen, there were 1,500 policemen, we had sensitized all the units of police force so that no untoward incident happen," the minister said. Cops struggled to control thousands of revelers who had poured out on the streets at midnight. He said more than 25 CCTV cameras are installed in the area and their footage will be examined by the police. Bengaluru is in shock after a photojournalist from the newspaper Bangalore Mirror alleged that he had seen several distraught women approaching police women and complaining that hooligans had molested them and made lewd remarks during the New Year's celebrations on December 31. Photos published by the newspaper show women seeking help from the police. The newspaper report said the young women were seen running towards the cops for help, some holding their shoes in their hands as they tried to get away faster from their attackers. Some, the report said, were weeping. Several women approached police in Bengaluru complaining hooligans had molested them. The city police said no complaint has been registered so far, but they are gathering more information about what happened. "Since such reports have come we will identify culprits and take action, Karnataka's Director General of Police Om Prakash said.